I spent the day at the Vancouver Convention Centre (West) at what was billed as “A New Conversation about Transportation and the Economy”. Position papers, presentations, videos and other materials from the sessions are now posted at movingthefuture.ca. Attendees at the conference were encouraged to tweet using the hashtag #movingthefuture and a quick search on tweet deck showed that they did, in large numbers. Though early on they seemed dismayed that the news out of Toronto was beating them in the trend analysis. Gord Price was there. He did raise the question of who thinks the referendum will pass (note that is not the same as ‘should it pass’) and more hands went up for no rather than yes. But on the other hand, certainly from the platform, it seemed that there is consensus that we need transit expansion. Indeed, the problem is not that we cannot agree on what to do – Transport 2040 is the approved plan – but how to do it. The New Car Dealers of BC were one of the sponsors, and so got a moment on the platform. There were introductions of the people who were going to do the introductions of the speakers! By the way sponsors like the car dealers, BNSF and NAIOP got to sit at their own exclusive tables. Which seems to me to be somewhat contrary to the spirit of the thing. Shouldn’t there have been more opportunity to talk amongst ourselves and meet people with different viewpoints? An anonymous commenter from the floor stated that environmentalists – who have been very generously funded from the United States – have got ahead of business on the issue of pipelines and there is therefore a need for business to respond. Frankly I have no idea where this idea comes from, and I have yet to meet an environmentalist who was even remotely wealthy – with the exception of Ducks Unlimited. Stephen Toop (President and Vice Chancellor of UBC) noted that there is consenus on what needs to be done but “constant churn on how to get there”. The gap is not in the vision but the implementation. Several people repeated the same observation: density has not increased at many Vancouver SkyTrain stations mainly due to opposition from the neighbourhood organizations. Michael Goldberg (Dean Emeritus, Suader School of Business) was perhaps the most eloquent. Broadway and Commercial is the oat accessible point in Western Canada but all it has is a Safeway and a large car park with some low level retail. It ought to be a node of high density development. (And so should 29th Avenue and Nanaimo stations.) There was perhaps rather too much on how Hong Kong uses real estate development to pay for transit. And how much better that city is than Bangkok. There was also talk of the need for resiliency which resides in redundant systems: in evidence I would cite the recent dislocations caused by one overpass strike in Delta (Highway 99 at Highway 10) or the SkyTrain power rail dislodged near Main Street this week. I have to say that my overwhelming feeling is that this is not a new conversation at all. It is the same conversation I have heard ever since I got here – and actually very similar to conversations in Toronto and London. Maybe, as Eric Doherty observed, we need to study more carefully what they have done in Zurich. Bruce Campbell executive director of the Canadian Centre for Policy Alternatives summarizes his own study into the crash of an unattended oil train in Quebec in an op ed piece for the Toronto Star. It is a disturbing read: I went on to read the entire study which you can also download as a pdf. “In other words, I accuse you, Mr Prime Minister, you and your government, of being at the top of the pyramid of responsibility for the tragedy that occurred at Lac-Mégantic”. Bakan, Joel. The Corporation, Penguin, 2007, 150. Conservative ideology holds that deregulation lowers costs to business, which increases profits, which lead to more investment, which in turn leads to faster economic growth and increased job creation. There are no credible studies that demonstrate empirically the existence of such a causal chain. It is simply declared as fact by free market doctrine. On the contrary there is much evidence that deregulation, including in the railway industry, has resulted in job loss …Profits have increased, but business investment …has stagnated. I have a couple of cautions to add. Economic growth is no longer desirable – at least in the advanced western economies – since it is tied to further depredations on the environment which threaten our existence. Even if there were such a causal chain, I would dispute that the supposed benefits of economic growth and the type of job creation would be worth the damage that inevitably results to us and our planet. There are other models we could look at – Norway, Iceland and Cuba come top of mind – but there are others who manage to run our sort of economy with much more regulation, and see greater safety, security and better public health as a result. It is not actually necessary for the exceedingly wealthy to get any better off, but it is very important for us to reset some of the conditions that we used to enjoy up until quite recently. We did not have to revert to a Dickensian society to learn that unbridled capitalism was going to cause disasters. The conclusion of the report is more a set of questions than specific remedies. But given events playing out now on Parliament Hill, it is my hope that the hold that conservatism has had on popular imagination will be broken. The election of the Conservatives only came due to the distaste that the electorate felt at the corruption of the Liberals. The Conservatives have now shown that they are no better, and just as concerned at feathering their own nest, as well as concentrating solely on the well being of their corporate sponsors. The sequence of events that led to the derailment of the train and the destruction of Lac-Mégantic, with the loss of so many lives, can be seen to be the result of the federal government giving up a very significant level of responsibility. “Cutting red tape” sounds like a Good Idea, until you begin to realize that there was a purpose to regulation. And that regulation resulting from careful consideration and experience is far better than those slapped quickly into place as part of a public relations campaign to paper over the cracks. The regulation also has to be enforced effectively, and we cannot expect corporations – in any industry – to regulate their own activities in ways that put the pubic interest first. The recent passenger train crash on New York has disabused me of the notion that PTC is actually being implemented – it is legislated to happen but the railways are dragging their feet (of course). And to understand more about the fuel the train was carrying I suggest you read the Globe and Mail series – even though it is paywalled. This review isn’t focused on increasing speed limits, rather making sure we have the right speed limits. So in some cases speed limits might be reduced. Yeah, right. 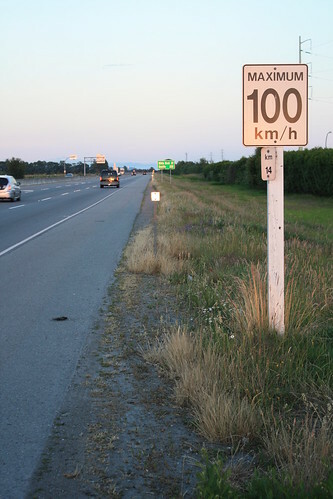 There is a real problem with speed limits in BC, and that is not the level that they are set at The problem is that too many drivers believe that the speed limit does not apply to them. They have a car which is capable of much higher speeds, and, like all drivers, they know that they are of above average ability. Speed limits, according to this mind set, are merely suggestions for the elderly and those driving older, cheaper models. An even greater proportion of drivers view speed limits as the speed at which everybody ought to drive at, no matter what the conditions. Anyone driving slower than the posted speed is simply trying to get in everyone else’s way and needs to be taught a lesson. So tailgating, honking, light flashing and alarming manoeuvres are mandated. Ever since Gordon Campbell secured his personal popularity by abolishing photo radar, the respect for speed limits has diminished. I have written about that here quite often. I have also pointed to the simple facts of physics that when collisions do occur, severities increase with speed. What is a fender bender at 30 km/hr is fatal at 130. If speed limits are widely ignored – and my experience suggests that is the case, and you can repeat that experimentally by observing the speed limit on any rural highway and count those who overtake you – then it probably does not make a great deal of difference what the posted speed is. The people who drive fast will continue to drive at whatever speed they feel like, because they do not have any need to consider the consequences. We have, thanks to pressure from a very powerful lobby group (Mothers Against Drunk Driving), reduced our tolerance for drinking and driving. Enforcement has been increased, to the point of actually infringing a number of important legal principles like due process, and stop without cause. Presumption of innocence has long been dead. Attitudes have shifted, and people worry when they drink and drive: not that they might cause a death or severe injury to themselves or others, but that they will be apprehended and have to pay a penalty. And that has affected enough people that places that serve alcohol have noticed an impact on their businesses. It was not enough, unfortunately, to ensure that Gordon Campbell was driven from office when found guilty of drunk driving in Hawaii. I believe that caving to the loud protests against photo radar has had an equal and opposite effect. Firstly, when there was photo radar, the police announced a margin of tolerance. Ever since there has been a widespread popular belief, that a speed limit sign can have 10% added to it before running the risk of penalty. Not that that was the tolerance level on photo radar, and not that that is now significant. But secondly, the very idea that speed limits need to be enforced is now regarded as some quaint obsession. The police – runs this popular belief – would be better employed tracking down thieves or hooligans, not otherwise Good People who happen not to have noticed either their speedometer or the road side sign. Or that the sign was posted by people more concerned with political correctness than “real” road safety. Raising speed limits will certainly appeal to a significant sector of the population. But I think those people are more than likely BC Liberal voters already. I suppose there are some Conservatives – and Libertarians – that might be won over. But the rural, car/truck driving longer distance types are already on side. This move will not do anything to win over those who have other concerns, but it does appeal to the BC Liberal base. The other thing that needs to be noted is that no one is talking about fuel consumption. Higher speeds increase it, which means that emissions increase too: specifically greenhouse gas emissions. We are boiling the planet, and must reduce our emissions – and should have started doing that twenty years ago or more. The science of the impact of human activity on climate change is not in doubt. The need to reduce fossil fuel use is not negotiable. But that is not part of this review. Nowhere is it even mentioned. The only time I can recall that speed limits were generally reduced was the first oil shock. It had nothing to do with road safety – though that was its immediate effect. Every road in the US that had previously not had a posted limit, was now reduced to 55mph. That was designed with one end in view: reduce gasoline consumption. It did, but not by very much apparently, and the need to do that has not gone away. It is now even more important than it was then. But I do not expect that to be of much concern to this government, based on their current obsessions. 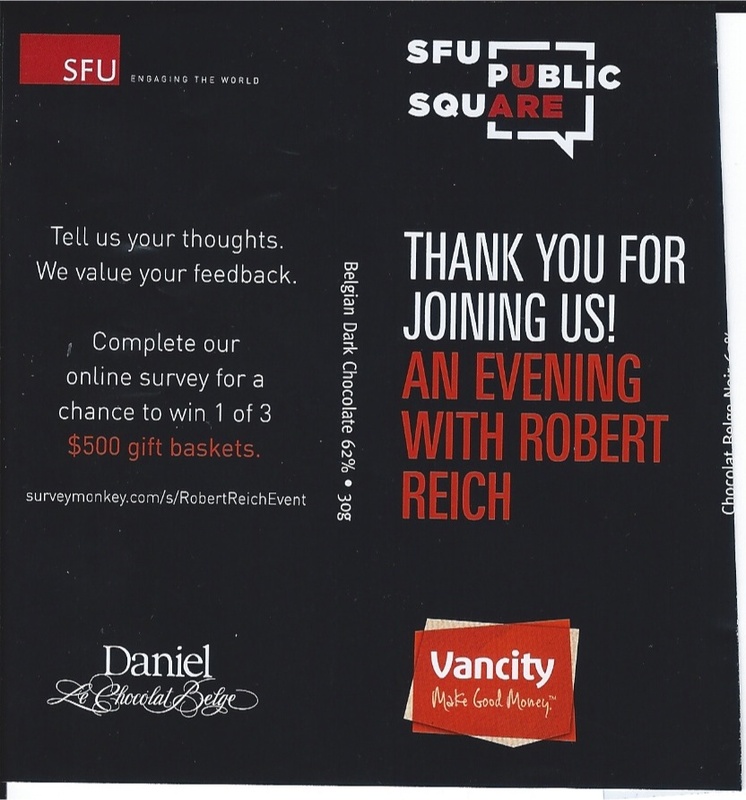 This SFU Public Square event was part of their 2013 Community Summit “Charting BC’s Economic Future”. It was live web cast . I would hope that it will be available as a recording on line but I can not find any commitment to that. I am linking to the Public Square site in the hopes that you will be able to find your way to it eventually but I will come back and check. The Orpheum Theatre was pretty well filled, and according to the organizers it became a trending event on twitter the evening. I have made a storify using the hashtag #sfups. His theme was inequality and is tied in to his new movie which is not yet available here. But there is, of course, a web site. UPDATE Very much to my surprise the entire text of his speech is now on the Georgia Straight. He is a very engaging and entertaining speaker. The format chosen was that there were lots of introductions and plugging of sponsors, a short address and then a very easy interview with Anna Maria Tremonti lobbing very soft questions and even some pre-recorded questions from a carefully chosen and quite unrepresentative sample of people. But all good stuff and well worth your time, once the webcast is available. What really surprised me was the number of people who left before the end of the event. I do hope that those people did not get the free bar of chocolate.